Ronnie O'Sullivan says he's "over the moon" that he's never been nominated for BBC Sports Personality of the Year. The 42-year-old won his sixth UK Championship title on Sunday and beat Michael Georgiou in the Scottish Open first round on Tuesday. Steve Davis won SPOTY in 1988 and said O'Sullivan is one of Britain's "greatest sporting personalities". "I'm so happy I don't get nominated because I never would want to go," said O'Sullivan, 42. "It's not my type of thing - standing around at some gathering - it's not my scene and I really hope I never get nominated." O'Sullivan equalled Davis's record of six UK Championship titles and also equalled Stephen Hendry's record of 18 Triple Crown titles. He also has five World Championship titles and seven Masters triumphs. This week O'Sullivan is aiming to lift the Stephen Hendry Trophy, which is the prize for the winner of the Scottish Open in Glasgow. He beat Georgiou 4-1 to book his place in the second round. "I love being here," O'Sullivan told BBC Scotland. "I love Sauchiehall Street, just walking around there. There's a great buzz about the city. O'Sullivan says he is "not afraid to take time away from the game"
"I enjoy Scotland and I've got some good friends here. I'll try my best and if I can win another tournament then great. "I do feel a bit jaded so I don't expect miracles. Come January and leading up to the World Championship I'll be able to get a bit more practice and prepare better for tournaments. "The last seven weeks, one tournament has rolled into another and although I've been winning matches, you do miss something." O'Sullivan has now been involved at the top end of snooker for 25 years, having turned pro in 1992. 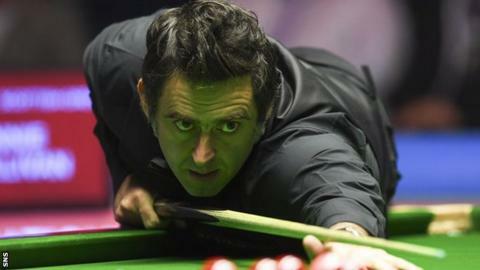 "You have to embrace old age," added O'Sullivan. "With old age comes a bit of wisdom, experience and maybe a little bit less harshness. "For me now it's just about enjoyment. I'm not afraid to take time away from the game. "I'm not chasing ranking points; I'm not chasing anything. I'm fortunate that I've got a good life and I've got to appreciate that." China's Cao Yupeng made a maximum 147 break in his 4-0 win over Andrew Higginson. Alan McManus made it through to the second round by beating Matthew Selt 4-2 and fellow Scot Anthony McGill won 4-0 against Ryan Day. But two other Scottish players, Ross Muir and Ross Vallance, were knocked out, while UK Championship runner-up Shaun Murphy suffered a shock 4-3 defeat by Welshman Daniel Wells. Peter Ebdon and Ding Junhui both won 4-2, against Aditya Mehta and Jak Jones, respectively. Jimmy White overcame Akani Songsermsawad 4-1 and 1997 world champion Ken Doherty lost 4-1 to Craig Steadman.